Urban Ecology as Science, Culture and Power is an intense interdisciplinary reading and discussion seminar that covers the wide range of academic discourses that have emerged during the last 15-20 years around urban ecology, urban nature and urban environment. The course has been held at the KTH Environmental Humanities Laboratory in Stockholm in June 2013, and before that as a seminar at the Stockholm Resilience Centre in 2012. No date is currently set for the next course. For more information see below and for the literature list, see here. How can we understand urban ecology? 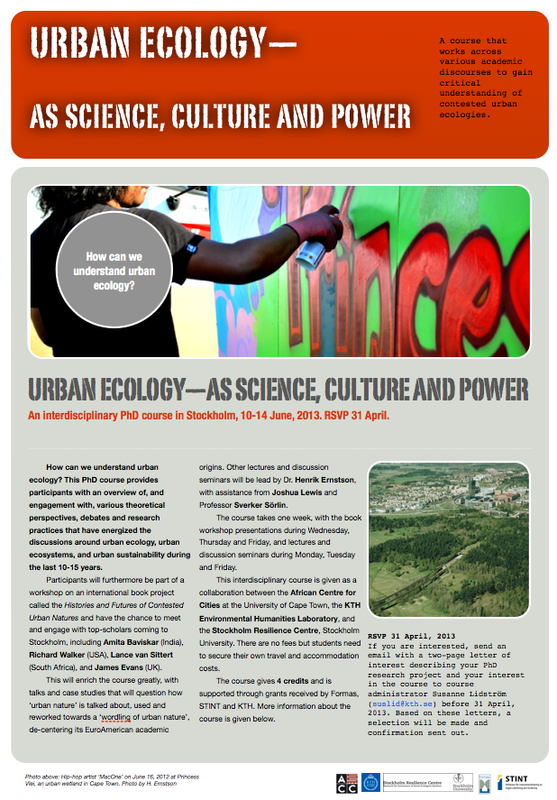 This PhD course provides participants with an overview of, and engagement with, various theoretical perspectives, debates and research practices that have energized the discussions around urban ecology, urban ecosystems, and urban sustainability during the last 10-15 years. At the intersection of increasing urbanization and ecological crises, there has been an intense theoretical debate on how to understand and research urban nature and urban ecology. As a way to gain oversight of the latest 10-15 years of academic production, this course provides four fields of value to discuss, namely (i) urban ecological and urban social-ecological systems research, (ii) cultural geography, (iii) urban environmental history, and (iv) urban political ecology. Although sub-divisions within these fields can be done, they all share an interest in understanding the long-standing question of how humans modify, and are in turn modified as part of biophysical environments, but with different emphasis and traditions of thought. They also, in various ways, places a central emphasis on urbanization and the city as a conceptual and empirical starting point towards broader discussions within natural and social science, and the humanities. To describe the main features of the production of research across these fields means to work through a continuous shift of how to understand what urban ecology is, and how one can gain knowledge about urban ecology and urban nature. When put together in a course like this, these ontological and epistemological shifts, through supporting and contesting each other, opens interpretative possibilities—a prism for viewing urban ecology as science, culture and power. Included in these discussions hovers the question of what role ‘urban nature’—as cultural symbol and biophysical reality—plays in wider circuits of power and governing logics. In this PhD course we will carefully work through these fields to familiarize participants with each respective field’s overarching structure of thought and practice. Through lectures and seminars, complemented with paper presentations at the book workshop, this will allow us to discuss, and explore how these fields overlap and contest each other towards enriching our understanding of urban ecology as material condition, academic discourse, and political tool. The course thus aims to provide participants with a familiarity of an extensive and varied literature. But also intellectual capacity to critically unpack the politics of urban ecology, and the abilities and disabilities to create more democratic and sustainable forms of urbanization. What scientific registers and systems theoretical perspectives are used to gain insights into the bewildering, unorthodox and hybrid character of urban ecosystems? How do we historicize urban nature and urban ecology? How do we politicize urban nature and urban ecology? How is a worldling of urban nature achieved, i.e. how is urban nature/ecology spoken about differently from different parts of the world? What does this variance mean? How and why is it necessary to pluralize urban nature and urban ecology—into urban natures and ecologies? The course can therefore be taken by PhD students from social science, natural science and the humanities to enrich their PhD projects in different ways. Reading of all obligatory literature and preparation of notes on the literature to be prepared for lectures, discussions and book workshop. Write a 2-page outline of an essay that starts discussing the literature in relation to your ongoing PhD project to be handed in one week before course start. More details will follow. Active participation during the whole course work. Short 5 minute presentation of your research project on the first course day. This should entail case study description (if applicable), theoretical framework, and possible results and insights so far. If you use presentation software, no more than 3 slides. But rather be creative and bring something else—a thing, a symbol, a piece of clothing, an artifact—and use that as a way to bring us closer to your field work and PhD project experience. Hand in an essay after the course that is geared towards a research publication, which engages your PhD work through the literature of the course. This will be examined and feedback will be given. More information will follow. Urban ecology as a scientific field emerged as a comprehensive field of study in earnest only through the large research grants in the USA in the 1990‘s. The so called Long-Term Ecological Research projects (LTER) in the cities of Baltimore, Phoenix and Seattle firmly established ‘cities as ecosystems’ through teams lead by researchers trained in the ecological and biological sciences; Steward Pickett, Nancy Grimm and Marina Alberti respectively. This perspective has been enriched by studies by urban ecology groups elsewhere, not least those at Stockholm Resilience Centre. Although a core interest has been in ‘green areas’, urban forests and wetlands, which have traditionally been seen as objects of study in ecological research, these groups have also framed the whole city as a biophysical system, including houses, motorways and green spaces as active parts. This perspective is based on complex adaptive systems theory (a la Santa Fe), resilience theory, and is presented as a scientific approach to understand and intervene in urban nature and urban ecology using ecological sciences. It has grown fond to express the value of nature through the ecosystem services framework. Some social science has been integrated, but less so when it comes to social theory and the humanities, including historical research. More nuanced discussions of power, identity, contestation and cultural interpretation has difficulties to fit within its ecosystem model and ‘the social’ tend to enter as ‘boxes’ or ‘factors’, with ‘feedbacks’ to ecological boxes and factors. Cultural geographic renderings of urban nature have taken an interest in how cultural identities are co-constructed with engagements with urban spaces. Urban nature is viewed as relationally and socially constructed through different networks of power and identity (following for instance Massey), and a more recent move to explicitly draw upon post-structuralist theory to trace and describe such relational processes. Through the latter, the materiality of the city, its ‘urban nature’ is viewed as relationally constructed through socio-material networks whereby also the physicality of objects and things are given agency in understanding the way nature is engaged, modified, and acts back on ‘social projects’ (Murdoch, 2006). Different actors, from planners to residential user groups, use different practices that engage urban spaces and natures, and each create their meaning of space which can overlap, contest each other, or collaborate to stabilize meaning and identities, and processes of inclusion and exclusion. Increasingly, cultural geographers have made use of actor-network theory (ANT)(Hinchliffe et al., 2005; Hinchliffe and Whatmore, 2006; Murdoch, 2006) and assemblage thinking (McFarlane, 2011) to describe these processes. Nature is here used, and thus modified, to express, construct and sustain cultural identities, and social projects. Parks, nature reserves, city squares, buildings and motorways can be part of such analysis and a system perspective is not needed—but networks and relations are key metaphors (especially in poststructuralist accounts), and it works with a ‘flat ontology’, avoiding a dependence on ‘grand theory’ like resilience theory or Marxist theory. An historical understanding of urban nature has been developed by environmental historians—e.g. Cronon (1991) on Chicago, and Gandy (2002, 2006) on New York and Lagos—and further by more theory-driven urban political ecologists, see for instance Swyngedouw (1997, 2004) on Guyaquil, Kaika (2005) on Athens and other case studies in the edited volume In the Nature of Cities (Heynen, Kaika and Swyngedouw 2006). Through environmental historians ‘the city’ is viewed as constructed by sociocultural and often capitalist processes of accumulation that produces ‘second nature’. This involves the formation of elites and labour classes and the (administrative and material) technologies through which ‘first nature’ (in the country) can be commodified and brought into the markets and be used to construct ‘second nature’ as in cars, trains, computers, and thus ‘the city’ itself. The “concrete and clay” of New York is part of urban nature, and the processes and social relations that made the movement of gravel and water to produce this ‘second nature’ is used as entry point to uncover how cities are made through social relations in an historical process. This describes the dialectical relationship between ‘the country and the city‘ and Marx’ notion of the labour process is key for un-packing this process of urbanization (see Bellamy-Foster, Harvey, Raymond Williams). The accessing of resources from afar, constructs a different nature in the city, a second nature, being the buildings, motorways, and parks, but also the things moving around in and between cities, cars, trains, boats, bicycles, which makes modern life possible, while supporting the circulation of capital. The city comes to us as dialectically related to ‘second nature’, or cyborgs—often seen as created through the imaginaries of the elite or the wealthy with greater social power (Swyngedouw, 1997, 2005; Kaika and Swynedouw, 2000). In supporting the broader process of capital accumulation, the city is (merely) an artifact to sustain this process, while being constructed and modified through the same process, in a dialectical relationship. Go here for a full literature list.